Infusion pumps are the vital devices used in healthcare to carry nutrients, medication and other essential fluids to patient’s body in controlled manner through veins and arterial routes. Infusion pumps are available in various sizes and functionality, but they are basically designed to infuse fluids and medication in patient’s body. Large infusion pumps makes up about 50%-60% of the total infusion market. These infusion pumps are the primary focus of safety concerns too, in recent years the market has witnessed unfavorable impact for various risks and concerns over infusion pump error, primarily due to inappropriate designs. According to US FDA, between 2005 and 2007 more than 56,000 adverse infusion pumps events were reported, more than any other medical technologies. In the same period more than 710 patients died and 87 infusion pump models were recalled. This major concern and restraint has however opened vast opportunities for the infusion pump manufacturers, with big market players already augmented investments and efforts exploring safer and advanced infusion technologies. For instance, Baxter a leading infusion pump manufacturer produces smart infusion pumps with software referred to as digital drug libraries, which is designed to reduce medication errors by automatically calculating doses and delivery rates. These smart infusion pumps also allow hospitals with advanced IT infrastructure to integrate infusion pumps data with EMRs to achieve extra layer of safety. 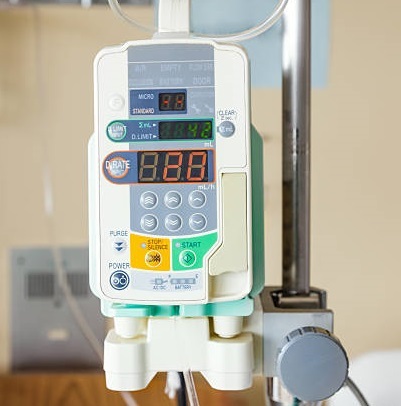 Over the forecast period, big market players will focus on enhanced product designs, safer infusion operations and minimized chances of product recalls which is expected to propel the growth of Infusion Pumps Market. Global infusion pumps market accounted for USD 7.2 billion in 2016 and is anticipated to reach USD 9.4 billion by 2024. Further, the global infusion pumps market is projected to register a CAGR of 5.9% during the forecast period i.e. 2016-2024 owing to number of factors such as growing incidence of chronic diseases coupled with geriatric population and transition of conventional healthcare to home-based healthcare. Based on geography, North America is the largest market for infusion pumps followed by Asia Pacific. Rising adoption of insulin pumps and growing healthcare services such as clinics and infusion centers are driving the infusion pumps market in North America. U.S. infusion pumps market is estimated to reach over USD 3.5 billion by 2024 from USD 2.6 billion in 2016. Moreover, Asia Pacific region is anticipated to register highest CAGR over the forecast period owing to factors such as rising geriatric population, accessibility of advanced healthcare facilities and rising penetration of advanced medical technologies among others. Further, the market share of Asia Pacific region is expected to rise from 22% in 2016 to more than 25% by 2024. Rising prevalence of chronic disease has significantly spurred the demand for infusion pumps in recent years. According to World Health Organization (WHO), the number of people suffering from diabetes has risen from 108 million in 1980 to 422 million in 2014, which has significantly driven the investments in diabetes care and fueled the demand for insulin infusion pumps. Technological innovations along with rising R&D activities on intravenous drug for malnutrition, type-1 diabetes, gastrointestinal disorders and neurological problems are also expected to provide potential opportunities to infusion pumps market to grow considerably. Moreover, constant R&D on implantable insulin pumps and wearable insulin pumps will remain a critical factor favoring the market growth and will help the market to gain a sprint in sales over the next few years. For instance, US FDA approved a wearable infusion device called the Pushtronix system to deliver 420 mg monthly dose. Pushtronix is based on the smart dose technology platform of West Pharmaceutical Services. The device is available in US since August 2016 and gaining enough popularity in healthcare sector. 6.2.4. Johnson & Johnson Private Ltd.
6.2.11. Becton, Dickinson and Co.
6.2.13. F. Hoffmann-la Roche Ltd.